A diverse clan of fearsome crocodilians once roamed the entire planet. Today, only 23 species remain in a handful of locales worldwide. We’ve all heard tales of the giant asteroid that did in the dinosaurs, but the demise of the crocodilians was far less dramatic. The crocs were picked off quietly, as our planet cooled off and dried up over the course of millions of years. Crocodilians — a group which includes crocodiles, alligators, caimans and the oft-neglected gharials — are the last surviving members of an ancient reptilian lineage known as the pseudosuchians. First appearing in the late Cretaceous period some 85 million years ago, crocs quickly spread all over the planet, diversifying into land-based giants like the eight-ton Sarcosuchus and real-world sea monsters like the shark-tailed thalattosuchians. While crocs weren’t wiped out during the K/T extinction that ended the reign of the dinos, most of species of the age-old lineage vanished over time. According to an analysis published this week in Nature Communications, a series of climactic and sea level changes dispatched with these impressive predators one by one. 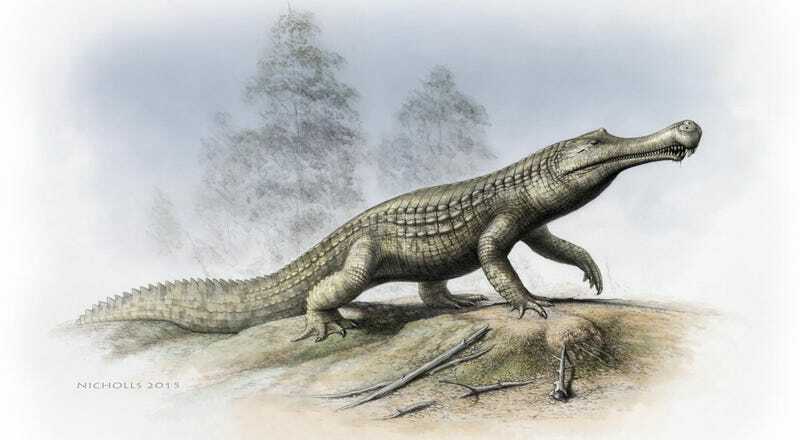 In the new study, researchers at several universities and the Smithsonian constructed the first comprehensive dataset containing the entire known fossil record of crocodilians, along with their extinct pseudosuchian relatives. The figure below, which depicts changes in the total number of pseudosuchian genera over the past 250 million years, shows just how dramatically this group has expanded and contracted over time as Earth’s thermostat has cycled up and down. Crocodilians, the one extant group of pseudosuchians, used to be all over the place, but today’s remaining species are restricted to a handful of tropical habitats. To piece together what happened, the researchers compared their fossil dataset with information on Earth’s climate in the recent geologic past. Crocs are ectotherms, meaning they can’t regulate their internal temperature. During the transition between the Eocene and Oligocene periods some 41 to 23 million years ago, climactic cooling killed off many land-based crocs in the Northern Hemisphere. Ten million years ago crocs suffered another blow when the vast, lush wetlands of North Africa dried up and gave way to our planet’s largest desert. Five million years ago in South America, the rise of the Andes Mountains displaced a massive, proto-Amazonian wetland. Out went the crocs. Marine crocodilians don’t appear to have been affected by climate change per se, but by sea level changes and accompanying shifts in the ecological balance of ocean communities. The slow demise of the crocs is a fascinating story about Earth’s geologic past, but it also raises questions about the future. If our fossil fuel emissions continue unchecked, we could find ourselves on course for a world similar to the hot, humid one once ruled by crocodilians. Will it be Rise of the Planet of the Crocs? That’s one potential side-effect of climate change which actually sounds pretty rad. But there are no guarantees. Remember, the Earth is heating up today because of humans — humans who take up lots of space, resources, and habitat. If we want these ancient predators to survive, it isn’t enough for us to just crank up the temperature. We’re going to have to do everything we can to protect them.